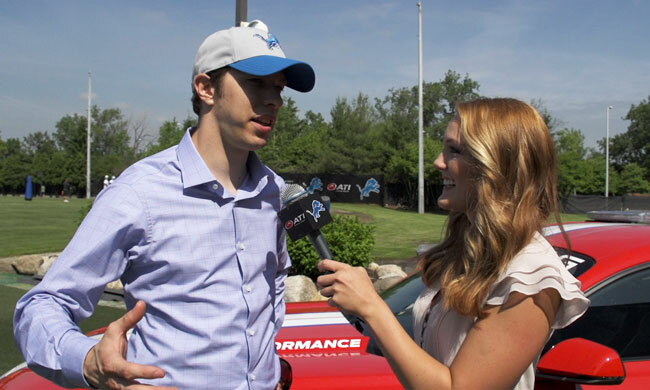 Having spent several years covering NASCAR and other motorsports in Florida before working for the Lions, Tori’s worlds collided when NASCAR driver and native Michigander Brad Keselowski attended Lions OTAs. She talked to Brad about growing up as a Lions fan and how he keeps up with his favorite team despite his busy life as a NASCAR star. NASCAR Driver Ben Kennedy made waves last weekend in Daytona when he made the pole position for the Camping World Truck Series as a rookie. 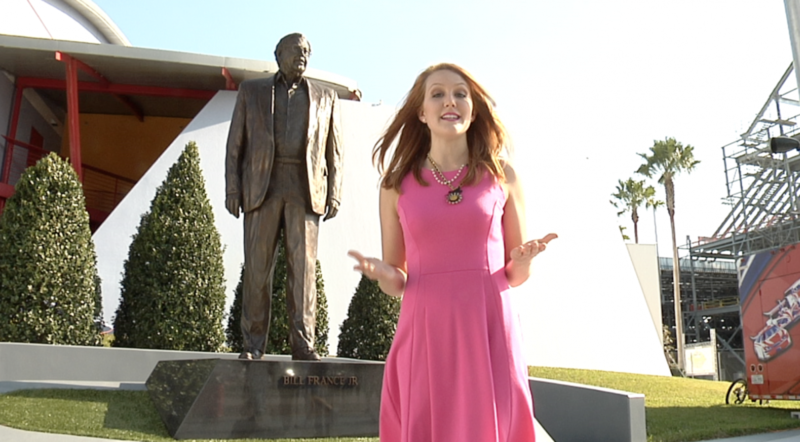 But you may not know that in addition to a full-time driver, Kennedy is also a normal college student. WUFT’s Tori Petry has more on this young talent. Kennedy is finishing his degree with an internship in Connecticut this semester and is set to graduate in May. This race had so much carnage, the pace car couldn’t even survive it. Yes, you read that right. Only 8 cars out of 18 finished the Sprint Unlimited Saturday night at Daytona, and after a massive wreck and the pace car catching fire, it was Denny Hamlin who came out on top. Grant Enfinger survived the chaos at Daytona to win his 3rd career ARCA race, but the big story was the drama that happened off the track. As is usually the case with ARCA at Daytona, carnage happened early. On lap 13, the 99 of Buster Graham spun out to end the night for 8 of the 40 cars – and caused quite a bit of drama on pit road. A scuffle between Graham and Chase Elliott’s crews ensued when the 99 team claimed Chase Elliott got into the back of Graham to cause the spin out. What Does Danica’s Pole Mean for NASCAR? Danica Patrick went into the history books on Sunday afternoon when she won the pole position for the Daytona 500. Her 196.434 mph lap made her the first woman ever to win a pole for a NASCAR Sprint Cup Series event. With her record-setting performance has come hoards of media attention and talk of what her spot on the front row means for the sport. But beyond the speculation – what exactly does it mean? Author vgpetryPosted on February 21, 2013 October 3, 2016 Categories Blog, Sports Opinion, WritingTags Daytona 500, Motorsports, NASCARLeave a comment on What Does Danica’s Pole Mean for NASCAR? Fuel mileage. Restrictor plates. Bump drafting. It sounds like a foreign language to those outside of the world of stock car racing, but to 75 million NASCAR fans, it’s their native tongue. Surprisingly, men aren’t the only ones who speak this language. 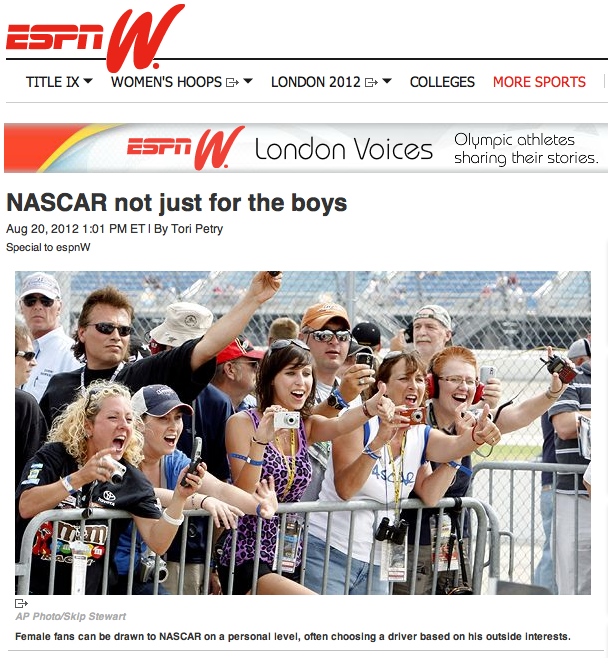 In fact, 40 percent of the NASCAR fan base is female. And they have no problem keeping up with the boys when it comes to talking about racing. When the checkered flag waved at Michigan Motor Speedway on Sunday, the 4-year wait was over. Dale Earnhardt Jr. had finally earned his much-anticipated 19th trip to Victory Lane, and the fans were nothing short of ecstatic. Tony Stewart drove his #14 car into second place 5 seconds behind the #88. “It’s not like it’s a national holiday, guys,” Stewart said of the racing world’s reaction to the win.